Hannah McCabe, Elk City, KS, and Calyssa Thomas, Harrold, SD, have been awarded Henry C. Gardiner Scholarships at Kansas State University. In addition to academic excellence both have been involved in their family beef operations as well as state and national industry related activities. Hannah, a junior majoring in Animal Science, is the daughter of Randy and Varee McCabe. Hannah has been actively involved in her family's Angus operation, National Junior Angus Association, Butler County Ag Ambassadors as well as many KSU campus activities. Calyssa is the daughter of Troy and VeaBea Thomas. Cally has been actively involved in her family's registered Charolais, Angus and Red Angus seedstock operation. She is a member of the K-State Livestock Judging Team and the K-State Rodeo Team, while maintaining a 4.0 grade point average. Hannah and Cally were selected from 25 stellar applicants. The applicants were narrowed to six and interviewed by a three-person panel to determine the two final recipients. Applicants were evaluated on academic excellence, work ethic, leadership potential and attitude. Recipients must express an interest in animal genetics, animal nutrition, animal health, reproductive management, agribusiness management or marketing. 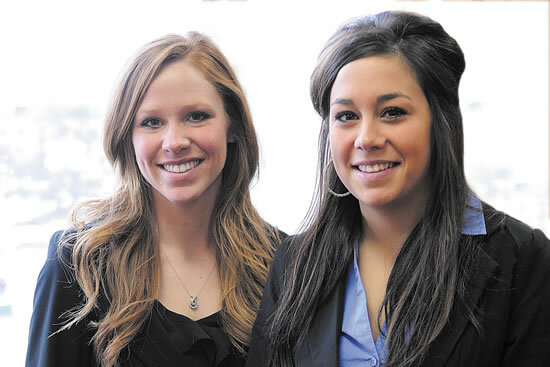 "These two young women are very deserving recipients of the first Henry C. Gardiner Scholarships to be awarded at K-State," said Mark Gardiner "Each in her own chosen direction will be an incredible advocate for the beef industry. Their accomplishments to date, their expressed future goals and obvious focus, discipline to excel and passion for the beef industry are impressive. The Gardiner family is thrilled to award scholarships to Hannah and Cally." The Henry C. Gardiner Scholarship is possible through the generous contributions of Gardiner customers, friends and family in an effort to continue the legacy of Henry Gardiner. Students classified as a rising-junior, junior or senior, either enrolled in or planning to enroll at Kansas State University with a major in Animal Science & Industry or closely related field may apply. Scholarship(s) will be awarded annually to students meeting rigorous criteria and exhibiting a passion to focus on improving the beef industry. Henry C. Gardiner instilled in his family the willingness, ambition and discipline to achieve goals. He challenged the beef industry to use science to develop tools that made rapid genetic improvements possible. Henry Gardiner readily incorporated technology, embraced change into his own business and was always willing to educate others about how they could do the same to improve profitability. Henry Gardiner's vision and leadership positioned Gardiner Angus Ranch as a world leader in providing beef cattle genetics and shaping the beef industry today and in the future. Gardiner Angus Ranch is a family-owned and operated business that produces registered and commercial Angus cattle. The original ranch was homesteaded near Ashland, Kan., in 1885 by Henry Gardiner's grandfather. The ranch encompasses more than 50,000 acres. The Gardiner operation sells approximately 2,000 bulls and 1,500 registered and commercial females a year. Over 80% of the sale offering each year is the result of embryo transfer. Gardiner Angus Ranch is a founding member of U.S. Premium Beef, the producer-owned limited liability corporation with minority ownership in National Beef, the nation's fourth largest beef processing company. By providing access to a proven value-added processing system through GAR delivery rights, Gardiner Angus Ranch customers have received more than $3.7 million in premiums and dividends.